Calvin Coolidge Worthington (1920-2013) was a car dealer. During World War II he was an ace pilot with the U.S. Army Air Force and wanted to become a civilian pilot after his discharge, but couldn't qualify because of his lack of an education. At first he tried buying a gas station in Corpus Christi, Texas. In 1949, he bought a Hudson dealership in Huntington Park, California, which shortly was a Dodge dealership. 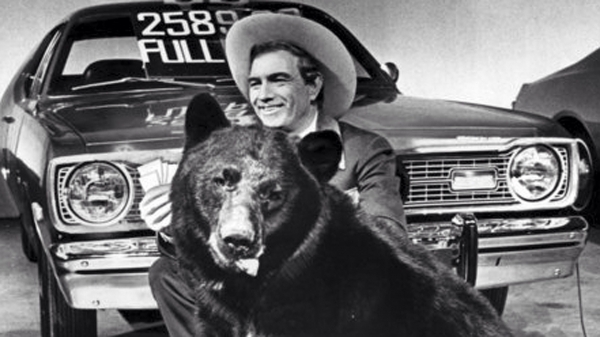 He began sponsoring a country music program on KTLA channel 5 in Los Angeles on Sunday afternoons called Cal's Corral. In the mid 1960s he watched a rival dealership in the L.A. area in which the spokesman involved his German shepherd. He thought that was silly so he came up with something sillier, a large animal, such as an elephant or a bear that would play the part of "my dog Spot." He sold a lot of cars that way. Eventually, Cal switched from selling Dodges to selling Fords, having a dealership in Long Beach. He had other dealerships in other parts of California, as well as other states. Today there are only two Worthington Ford dealerships left. The other one is in Anchorage, Alaska. Johnny Carson loved to make fun of him. I lived in Phoenix during the 1970s and I remember him. He did well, I guess, but I thought his commercials were silly and didn't make me want to buy a car from him.